More good news! Microsoft Intune now provides us with an even easier way to pre-configure an e-mail account for Outlook on iOS (and android). This is done with the use of an App Configuration Policy and the additions to the configuration designer when configuring the Outlook app. Let’s walk through the process. Do you need a simple, but yet effective way of forcing people into updating iOS on their company enrolled Apple devices? Simply block access to company resources if iOS is not up to date. 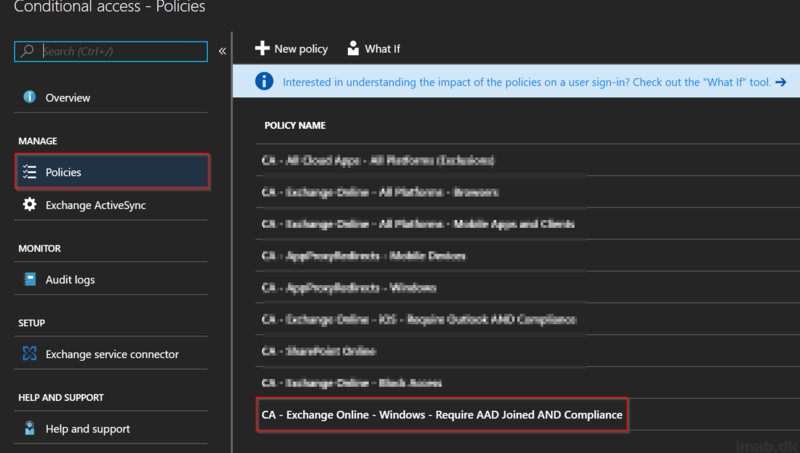 Here is how you can do that using Microsoft Intune and Conditional Access in Microsoft Azure. UE-V is not something new, but when combined with OneDrive Known Folder Move, Enterprise State Roaming in Azure and OneDrive as the storage path for UE-V, you will find yourself with a very solid solution ensuring roaming of end users data and settings. I have previously shown you how you can enable OneDrive KFM with SCCM. 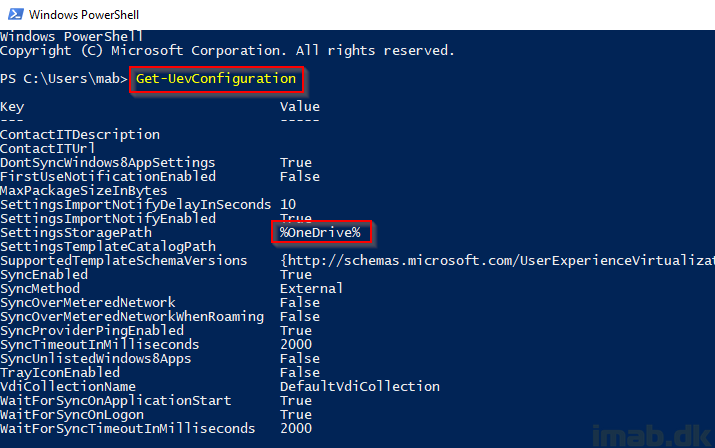 This time, I’m going to show you how you can enable UE-V during OSD with Configuration Manager, and how you make sure those settings are stored in OneDrive. I hope you can see the pattern here: No on-premise file share for UE-V settings – everything stored in the users OneDrive. More Configuration Manager 1806 and more awesomeness. 1806 gives us additional improvements to the Cloud Management Gateway and removes the need for PKI in your environment. With these improvements, it has never been easier to setup the CMG. In this post I will walk you through the exact steps I went through in order to successfully deploy the CMG in a HTTP only environment. Users with Office 365 administrator roles are very much sensitive users, and besides protecting them with various features such as Conditional Access and MFA, it might be interesting to know if someone tries to brute force or guess their credentials. 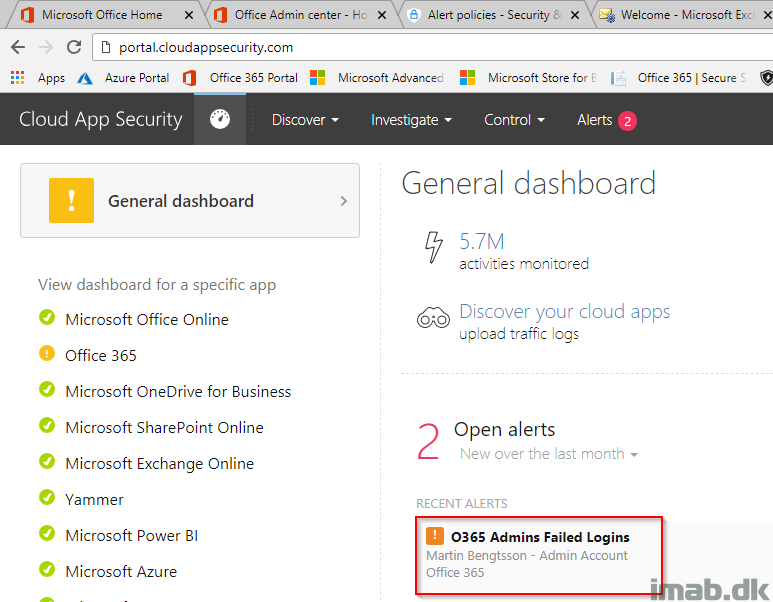 In this post I will walk you through how you can setup a policy in Cloud App Security, that automatically sends you an e-mail, if someone fails to provide the correct credentials for users with any Office 365 administrator role assigned. I have previously given a few examples on use cases for Conditional Access, and I admit, for the Conditional Access newbie, the options available can seem daunting. So how about a very simple scenario, where access to company resources are blocked, if not coming from a trusted IP? Imagine service accounts running some Powershell scripts for automation in your Azure/O365 tenant or other accounts who are never meant to be used outside of your organization. Simply block those from authenticating in Azure/O365 if not coming from your headquarter public IP. This is how you can do just that, using Conditional Access. 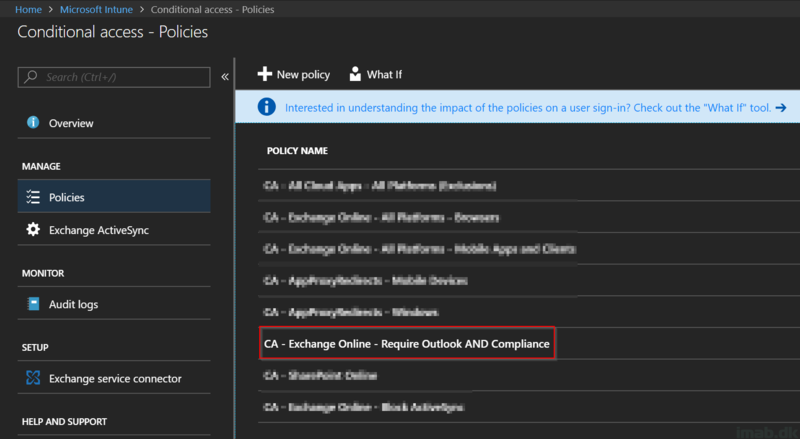 Last week I gave an example on how to leverage Microsoft Intune and Conditional Access to restrict access to Exchange Online for iOS devices. This week, I’m continuing the use of Microsoft Intune and Conditional Access, and will give an example on how to restrict access to company e-mail if not using a Windows 10 1803 device. All of this based on a computer co-managed with both Microsoft Intune and Configuration Manager. So basically; no e-mails if not running on the latest and greatest version of Windows 10 on my co-managed device. Long title, but that’s actually what this post is going to cover; how you can secure the access to company e-mail accounts and only allow access to such, if coming from an enrolled (compliant) Intune device and that device uses the Outlook app. I have previously done a short post on how to renew the Apple Push Certificate when having Intune integrated with Configuration Manager (Hybrid). Since then, I’ve changed the MDM authority to Intune standalone and therefore the procedure changes slightly. Again, this is taken directly from an production environment and my certificate was due to expire in roughly 30 days. For the curious, this is the exact steps I went through to renew our Apple Push Certificate in Microsoft Intune standalone. While brewing on a much more detailed post on how I moved my devices from Intune Hybrid with ConfigMgr to Intune standalone, I thought I’d share how you can offer webmail for your users, while requiring MFA (Multifactor Authentication) if not coming from a company device, using Conditional Access.